Sparkle and spice and everything nice! 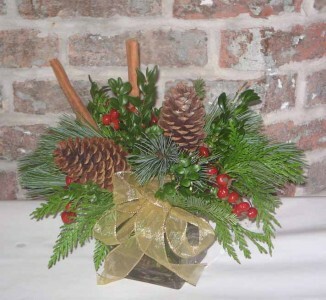 This darling design, again, in our cube vase, features a long-lasting mix of evergreens, berries, and cones. We've added cinnamon sticks to lend even more seasonal fragrance and wrapped it all up with a sparkly metallic bow. 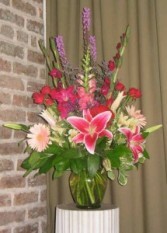 Our orchids generally run in the $75 to $100 range. The pictures on this page are representational of those prices. 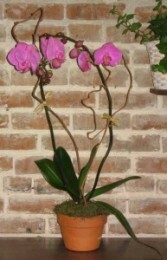 On occasion we are able to get larger Phalaenopsis orchids and also other varieties. Call, or email and ask about availability.